Being in the real estate means a lot of commitment and perseverance, and we do mean a lot. In order to get people to actually avail of what you are trying to sell, you will really need to know your thing and to go the extra mile to fully convince your prospects. But all these efforts will never go unrewarded since those in the real estate business are earning quite high, not to mention the commission splits they get when they are able to convert prospects to clients. 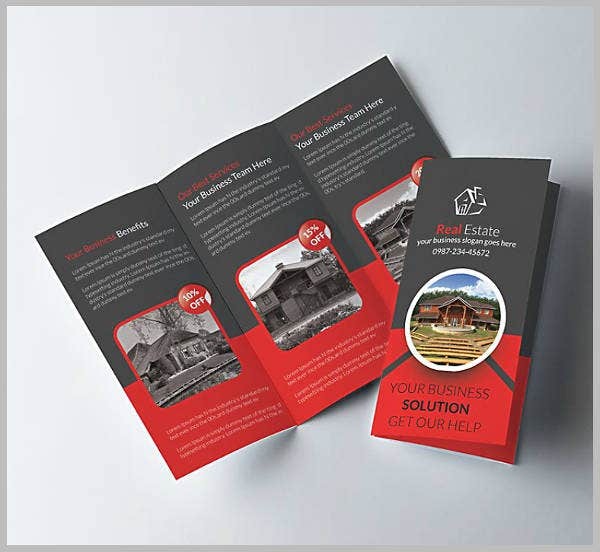 If you want to make the most in your marketing campaign for real estate properties, do it with the use of tri-fold brochures. 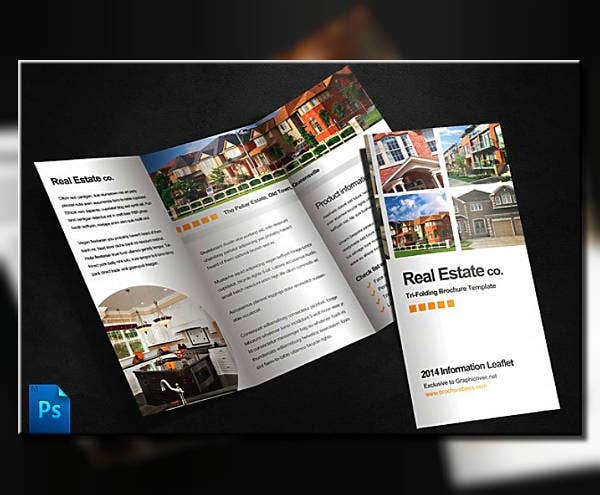 If this is what you need, then check out our collection of some of the best real estate tri-fold brochure samples on the internet. There are over sixteen creative brochure designs that you can choose from, and these range from minimalist to modern ones, so feel free to look into them and see which one fits your style perfectly. Above is a minimalist and organized real estate comapny brochure template that you may be interested in, and this one uses quite a lot of white space which actually helps in making the design clean. A real estate agent is a professional who acts as the middle-man between buyers and sellers of a given property. Their aim is to accomplish transactions between these two parties, when the buyer successfully purchases the property previously owned by the seller. Real estate agents are commonly licensed as a sales professional, which they can earn after undergoing the needed number of classes as well as passing a licensure examination. They are also referred to as real estate salesperson. You may also see tri-fold brochure samples. A real estate broker is a professional who also holds a license that can be earned by passing an exam. However, this exam is quite different from the one that is intended for real estate agents. The education taken by brokers are provided by accredited institutions and are actually required by the law, which makes their educational attainment a step higher than the agent’s. Brokers can either work alone, or they can also hire agents to work under them. A real estate associate broker is a professional who has already underwent the required education classes and has earned the brokers license. Though they are already qualified to become a real estate broker, they would rather choose to work under their management. You may also see free tri-fold brochures. The requirements for becoming a real estate broker may vary according to the state or country, but regardless of the place, these things are almost always needed. You may also see corporate real estate brochures. The number of units earned from education courses. Acquiring the necessary number of work hours depending on the place. An accomplishment of the required pre-licensing courses. Passing the broker’s licensure examination conducted in the state. Though these may be the most likely requirements that will be sought from you if you choose to become a broker, it is best not to rely solely on it and to go over the full list of requirements provided by your state. 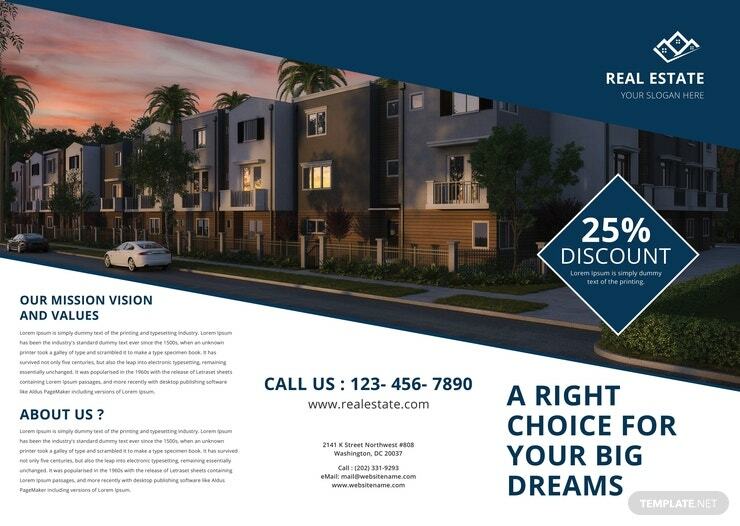 You may also see real estate company brochures. Let’s say you’re already working as a real estate agent, and a successful one as well, why not proceed to become a broker? Aside from handling more tasks and responsibilities, there are a few more aspects that real estate professionals can benefit from if they take the leap, and here are a few of those benefits. 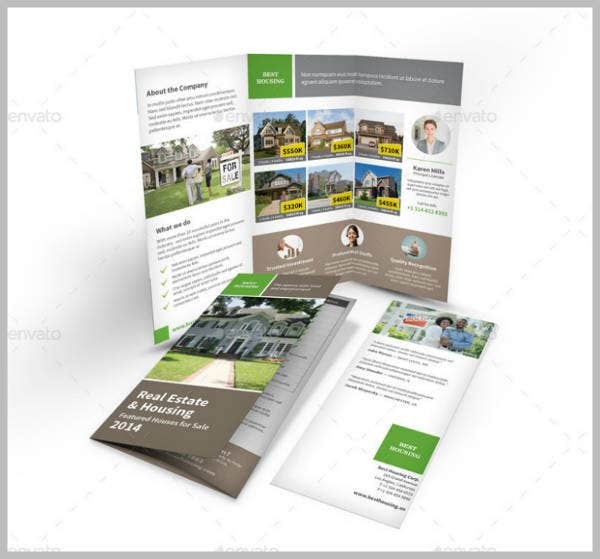 You may also see real estate catalog templates. 1. Unlike real estate agents, brokers can actually run their own real estate brokerage. One of the main and most important requirement to allow a person to open a brokerage is a brokers license, which is obviously something that brokers have. When running a brokerage, you can either work alone to have you receive all commissions, or you can also hire agents or associate brokers to work under you. You may also see real estate flyers. 2. When comparing the income earned between agents and brokers, the latter definitely have a greater amount because aside from being given more tasks, their license and profession actually have a higher value. Therefore, real estate brokers are more valuable in the industry and they should earn more. 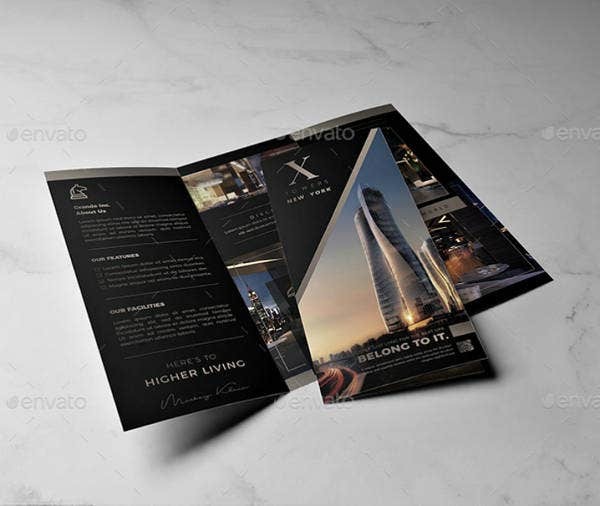 You may also see luxury brochure templates. 3. Aside from the money that brokers earn from their salary, they also have commissions after they can successfully complete transactions. Though agents can also get a share of the commission, brokers actually have better commission splits, and they even have the right to negotiate on this. 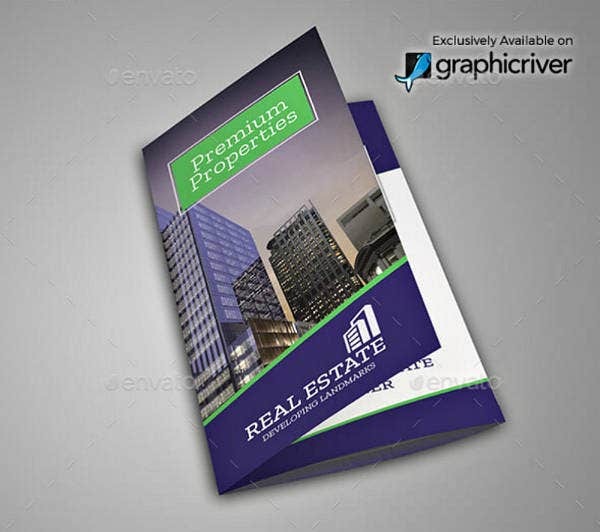 You may also see corporate real estate brochure samples. Green is the color used to symbolize safety, nature, growth, harmony, and environment, which makes it the perfect color for promoting real estate properties. If this color suits your business, then check out the green brochure template above. If you want something modern and elegant, then why not consider downloading the business brochure template above? The best thing about dark themes on designs is that they are often easier on the eyes and its elements are often unaffected by glares. Real estate companies specialize in serving people who intend on having their property sold as well as those people who are looking to buy a house or a piece of land from among those that are in the market, or those directly from a seller. In other words, real estate companies serve as the intermediary entity when it comes to selling and buying a piece of property. The best thing about asking the assistance from real estate companies when it comes to either selling or looking for a property is that they are actually aware of the options. These companies gather information from their clients which they will then use as a basis when giving their clients the different options to choose from. You may also see property brochures. Generally, the scope of the real estate’s job is very broad, but these are varied depending on the location. The limitations are mostly due to state laws that are governing this industry. Though one thing is similar, they do act as the coordinator between property buyers and sellers. 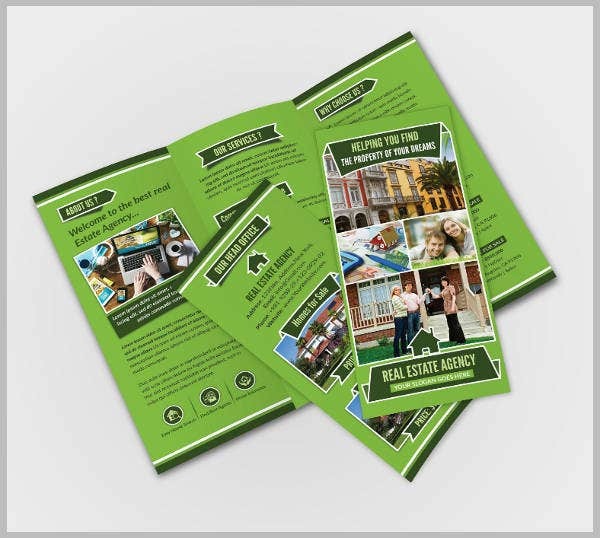 Square-shaped brochures give you the best of both worlds, they are able to provide you with more panels for organizing your content, and each panel is big enough for you to write down the features and details of the property, as well as the inclusion of a large enough photo of the property that you are trying to sell. 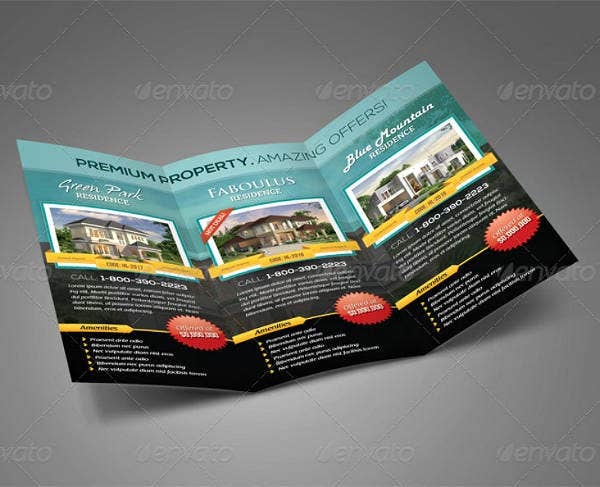 Also called a single-page or no-fold brochure, this type is just as similar as real estate flyers with the only difference being the method for distribution since flyers are either given by hand or posted on walls, whereas brochures are just left on racks or countertops. This type of brochure is ideal for promoting events, fundraising campaigns, and anything that doesn’t require too many information. 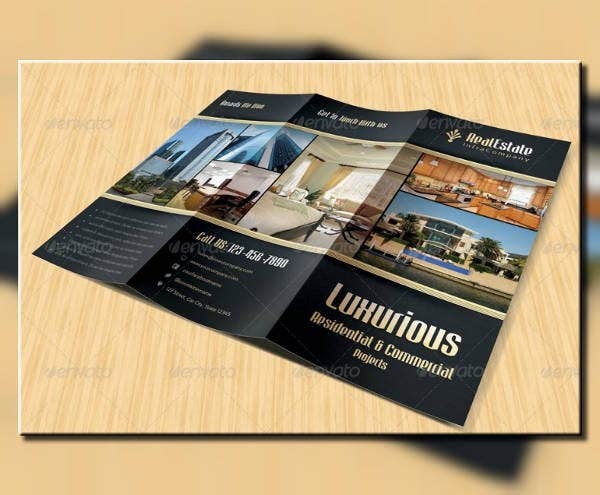 This type of brochure involves a car which is folded along the middle to come up with two equally-divided halves and a total of four panels. They very much resemble a booklet that consists of the front and back covers only, without the inside pages. 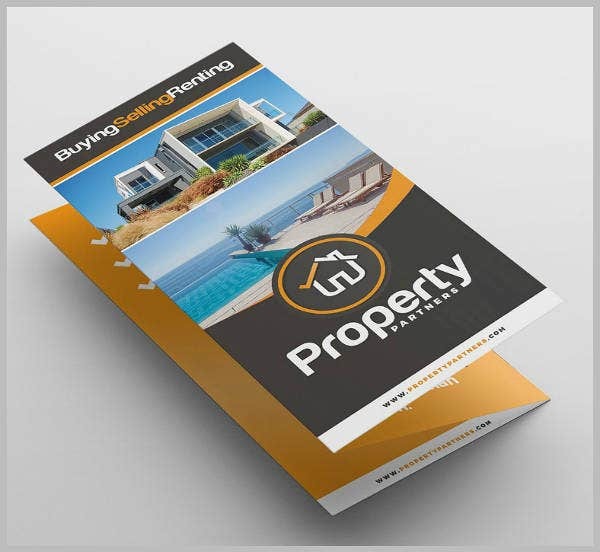 Bi-fold brochures are ideal for almost any type of marketing campaign since the number of panels that can be used are just as sufficient, they are neither too little nor too many. This type of brochure is the one used by the templates in this article. These brochures, from the name itself, consist of three equal divisions of the paper and a total of six panels. This can be achieved by folding the paper twice, with the two side panels folded inwards toward the center panel. 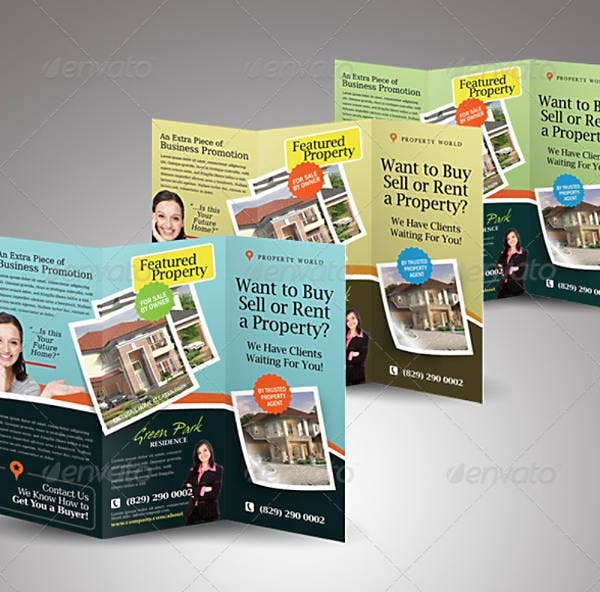 If you ever have something to promote and it requires you to convey a lot of details that need to be categorized for easy reading, then tri-fold business brochures are a perfect choice. 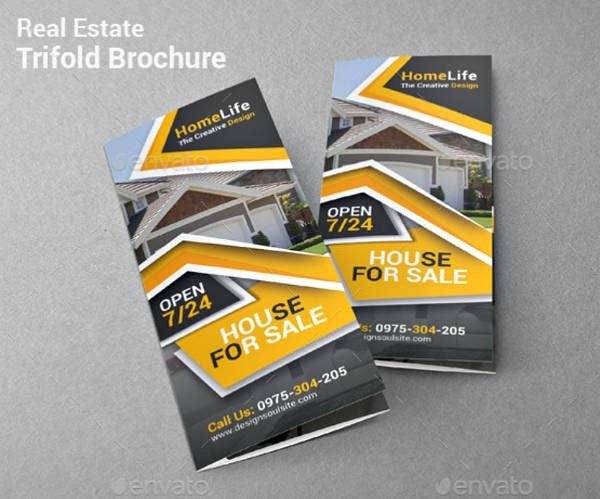 Actually, there are a lot more types of brochures that are being used for advertising or marketing campaigns, and these include the gate-fold, Z-fold, and the roll-fold. The ones that we have mentioned above are just some of the most commonly used types of brochures. 1. 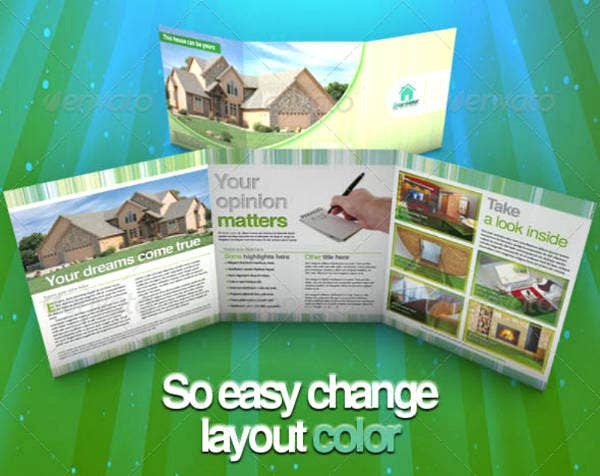 DO choose the right type of brochure for your campaign. 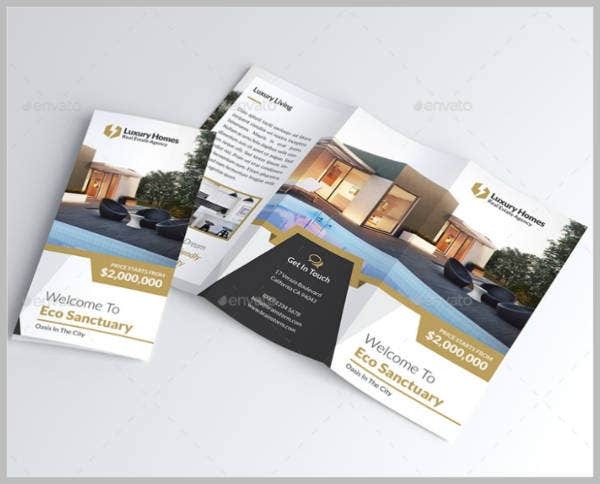 We have mentioned some of the most common types of brochures that are being used by businesses, and we also set a few examples for where each type of brochure is best used. Depending on the type of brochure you wish to choose, DON’T congests the design with too many elements. You may also see modern brochure templates. 2. DO pick the best font for the whole design, or you may have two at maximum. But whatever you do, DON’T go beyond three fonts for a single design, this will make often make the entire brochure quite confusing to read. 3. For the graphical elements that you want to use, DO use high-quality ones to allow the reader to appreciate what is being advertised. When adding images, DON’T settles for less.